Alaska provides me with limitless opportunities for my photographic endeavors, but by far, the majestic Bald Eagles have and will keep me coming back to capture their awe inspiring spirit, beauty and strength. And although our state has an abundance of eagles, there are many challenges that a photographer will encounter and learn to overcome in order to seize that perfect moment and image; light, weather, wind direction, background and eagle activity. 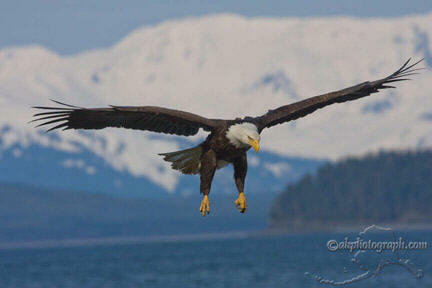 Communities in Southeast Alaska are the most populated with eagles. In the Chilkat Valley, near Haines, over 3,000 bald eagles congregate in late fall as the salmon spawn. If you take an Inside Passage cruise, eagles can be seen roosting in the trees near shore as you make your way through our beautiful scenery. 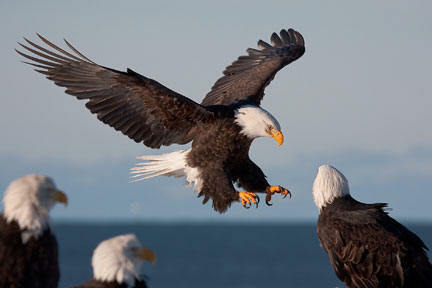 The image above was taken in Juneau and it combines light, wind direction and background into a very nice eagle image. Once I found these conditions and the eagles, it was very hard to pull myself away. I came across a group of them feeding on something near the shore and scared them off when I got out of the car. After sitting quietly on the rocky shore for 30 to 40 minutes they started to come back and I was able to take hundreds of photos. I had positioned myself so the light and wind would give me the best chance of getting some great shots. 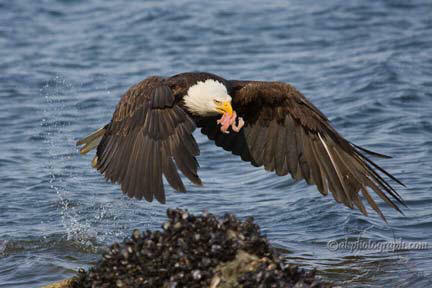 This eagle put his head under water and pulled out…. I’m not sure what it was, but as a predator, serious hunting of his food is what will sustain him. This image would not have been possible without quiet observation, patience and the gift of excellent natural light. And light is a reoccurring theme. On a recent trip to Homer, another capital location for eagles, the light was horrible. I pack an external flash for such occasions, in case I need an added light source. So I mounted it on a light stand and proceeded to photograph the eagles. Although my shutter speed was limited to 1/250 because of the flash, I was able to capture this shot. As a visitor, you can improve your chances of eagle viewing by visiting Juneau, Haines, Homer and Seward. So if you get the opportunity, please visit our incredible state. Story and photos: © 2009 Mike Criss. All rights reserved.